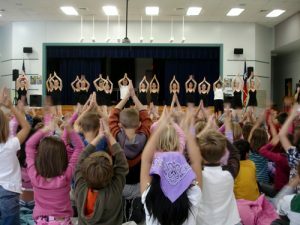 Learn for your own growth, or train to teach in any of the broad range of dance and fitness styles offered through Ballet Austin’s Butler Community School (ballet, modern, jazz, tap, hip-hop, Broadway, hula, yoga, Pilates mat). Schools and school districts may arrange for privately-held master classes for their teachers in order to earn CPE credits. Availability varies, please contact Ballet Austin for scheduling. Professional development sessions can be booked as a half day or full day. Half day sessions include one classroom topic and 2 master classes and full day sessions usually include 2 classroom topics and 2-3 master classes. Professional Development Curricula uses Microsoft PowerPoint with embedded videos. Varies depending on number of teaches and the length of the program.